(Easley, SC June 2017) – Ricky Rude (#14) gave it his all Saturday night, but a wily veteran prevented Rude from winning his fourth straight Minimizer Bandit Big Rig Series event. A packed house at Greenville-Pickens Speedway was treated to Mike Morgan’s (#88) first win of the 2017 season, as he bested Tommy Boileau (#16) and Rude for the checkered flag in the 25-lap A-main. “We’ve been waiting for this win since the start of the season,” Morgan said. Morgan and Boileau were back-and-forth before Morgan took control on the 14th lap. Rude may have had a better chance at his fourth straight win had he not had to pit mid-race following contact on a re-start. Despite the setback, he still managed to race his way to third by the end of the night. With the win, Morgan passes Justin Ball (#17) for second in the points standings. Rude remains on top with 2030.5 points, 115 in front of Morgan. 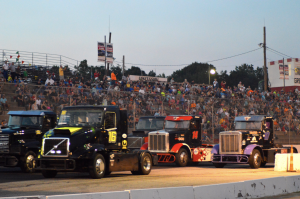 The Minimizer Bandit Big Rig Series moves on to Highland Rim Speedway in Greenbriar, Tennessee, July 1st. For additional information, please contact Brian Madsen at (507) 676-6627, or email brian@banditseries.com.